A few months ago I signed up for the Great Food Blogger Cookie Swap 2011 and immediately freaked out. Haha. While signing up I was thinking, "Oh! How fun! Make some cookies for fellow food bloggers?? Sure!" But then as soon as I was signed up I thought, "CRAP! BUT WHAT COOKIE WILL I MAKE!? There's so much pressure! These aren't just people, they're FOOD PEOPLE! An ordinary cookie just will not do! I'm so going to be judged....."
And so my quest began to 1. first think of a cookie to make and 2. decide how the heck to jazz it up A LOT! Last month my husband and I went on a trip for our 3rd year anniversary. We stayed at the nicest little B&B. While relaxing in front of their giant fireplace and drinking some hot apple cider we were brought some warm, gooey, freshly baked chocolate chip cookies and milk by Nina, one of the owners. Both my husband and I immediately felt all warm and fuzzy inside while we dunked our cookies in our milk and chowed down. That's when I thought, "Nothing beats a good chocolate chip cookie. Nothing." So I thought, this is the cookie. 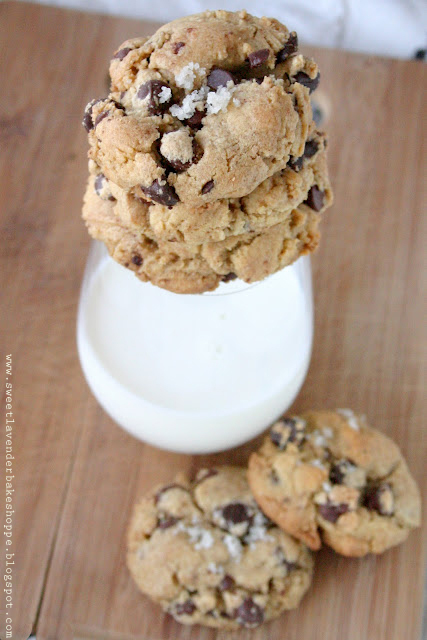 Next though, was how to make it more than just your "run of the mill" chocolate chip. I know if I were the recipient, I'd be a little bummed having signed up for this GREAT Food Blogger Cookie Swap to only receive plain 'ol chocolate chip. I think we probably all had this sort of raised bar of expectation...so I wanted to make sure I met that expectation. Enter Brown Butter and Grey Salt. <---ohmygoshareyouserious? YES. 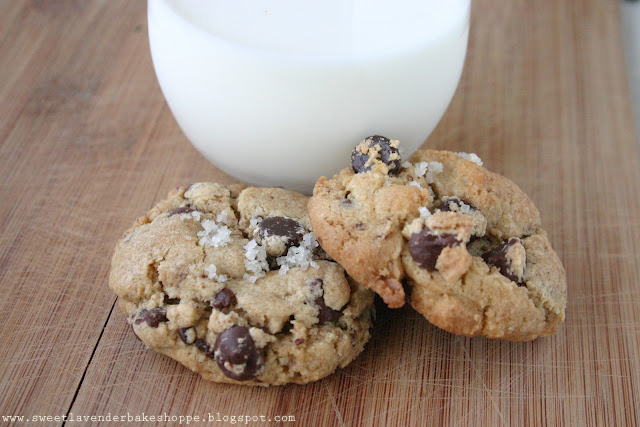 I knew that these two ingredients wouldn't take away or compete with what we love in a good chocolate chip...all they would do is enhance the cookie. Exactly what I wanted. 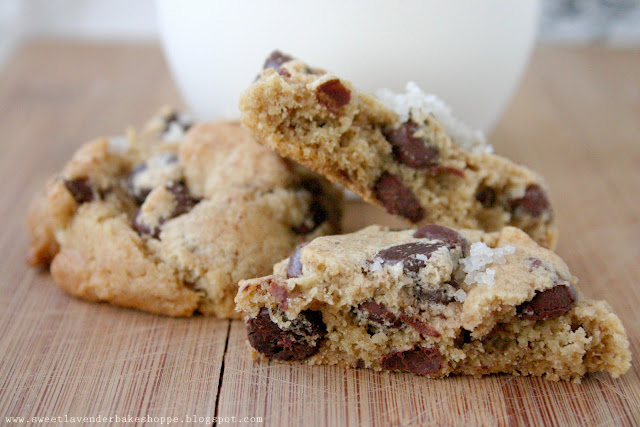 A while ago I had pinned a recipe for Jacques Torres' Chocolate Chip Cookies... I haven't had the time to make that recipe, although I've seen it ALL OVER le Pinterest. I feel like it might be the only chocolate chip cookie ever pinned..."Jacques Torres' secret recipe", etc. Seriously, go look...it's everywhere. If you don't know who Jacques Torres is, click here or here. He's kind of a big deal. Call me a "fad follower"...but I had to make his darn recipe and see what all the fuss was about. I just...haven't had..that time. ENTER- PERFECT TIMING!!! 1. 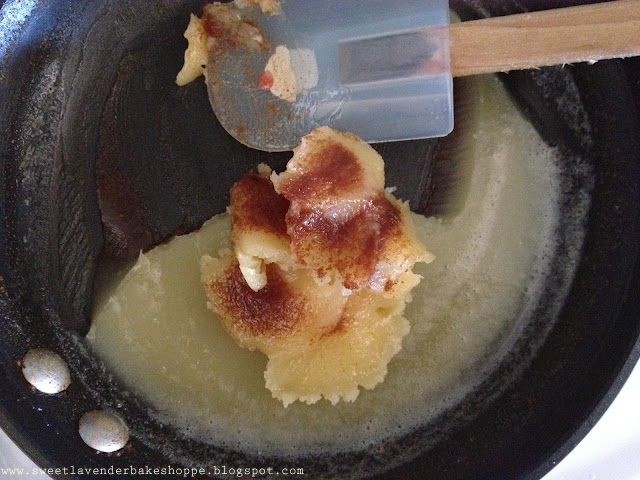 Brown butter: Place 2 1/2 sticks in a nonstick skillet over medium heat. Melt completely. Continue to cook gently over medium-low heat until it froths up. Once froth dies down, you should begin to smell a nutty scent (and see your butter turning light golden brown)- this means your butter had browned. :) Remove from heat and chill in fridge until a solid- about 20 minutes. Before using, you'll want butter to be soft and room temperature, if hardened too much in fridge, leave room temp on counter to soften. This is what your browned butter should look like before mixing with sugars! 2. Preheat oven to 350 degrees. Line a baking sheet with parchment paper or a silpat. 3. Sift both of your flours, baking soda, baking powder and salt into a bowl. Set aside. 4. Using a mixer with paddle attachment, mix together both of your sugars and softened solid browned butter. Beat until creamed and fluffy. 5. Next add your eggs, one at a time, mixing well after each. Scrape down bowl after each egg addition. 6. Stir in the vanilla. With mixer on low, add all the dry ingredients and mix until just combined, 5 to 10 seconds. 8. Using a 2" ice cream scoop, scoop out dough and place on baking sheet. Gently press down to create a flattened top surface. Sprinkle lightly with grey salt and bake until golden brown but still soft, about 15-18 minutes. I am SO freaking happy with how these cookies turned out. Warm and gooey and ooooooooh so chocolatey. The brown butter mixed with dark brown sugar gave the cookie an almost toffee/caramel flavor and then that salt on top!? JEEZ LOUISE! So good. My husband loved them, his co-workers loved them, and all three of my food bloggie recipients loved them! Success! Stay tuned for what my cookie packages looked like and what cookies I received in return! OH OH OH!! Before I forget! If you are interested in participating in NEXT year's cookie swap, click here! My mouth is watering right now. I agree nothing beats a good chewy warm chocolate chip cookie. Oh my god. Can I say that my greatest dessert weakness is salted sweets? Salted chocolate, caramels, etc ... I LOVE THEM. Needless to say, I went nutso over your cookies. Thank you so much for them, and I will definitely be making your recipe! I just read that you made your own vanilla extract. Sea Salt on Dessert, my fave! Thank you friends! Happy Baking! This really looks delicious. I'm definitely craving for a plate of that right now. Thanks for sharing this wonderful recipe. This is definitely a must do recipe this weekend since I got my ISO 22000 Training. Hey friends, I feel it's time for a little update :) Any comments which might be found inappropriate to myself or my readers, including but not limited to: Spam, Offensive or Rude Comments, Vulgar Language, and Self-Promotion Spam, will be deleted. ©Sweet Lavender Bake Shoppe 2010-2018. All images, unless otherwise noted belong to Christina Main, founder and creator of Sweet Lavender Bake Shoppe. Please do not remove any pictures from this blog unless you have written permission to do so. All recipes must be linked back to this website and it's appropriate recipe blog post in order to be used.